Praying for all monkeys in need and special prayers for Lumpy and family. I'm so sorry 4 Donks. I am so sorry. He was blessed to have you as his mommy. Prayers for peace for you. That is so beautiful, Brandi. I am so sorry 4Donks. He had a wonderful life with you, and the other donks and dogs. Your stories brought lots of Joy to all of us here. RIP Lumpy. My prayers are for you 4Donks. I know it is hard for you to say good bye because you are such a good caregiver. 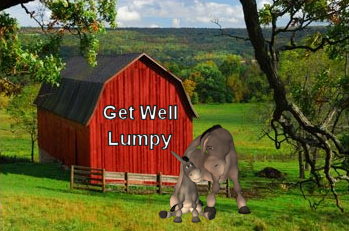 You are a kind and generous person - Lumpy was lucky to have you caring for him. 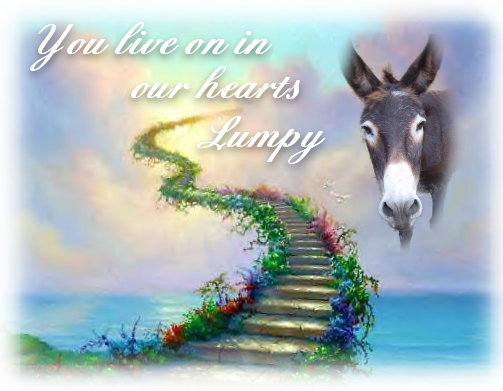 4Donks, when I read about Lumpy last night, I couldn't even post as my heart was aching so much for you, the other donks, and all your family and fur-babies. What a wonderful experience to know you cradled Lumpy so tenderly and I know your spirit mingled with his for his final journey. I believe with all my soul that our loving Lord gathers His creatures, both great and small, to His pasture where there is no pain and no suffering. Believing that we will be reunited with all our loved ones, including the fur-babies, brings such joy even in our times of extreme sorrow. You are such a strong woman with a tender heart . . . I know you delight our Lord. Plant the apple tree . . . it is so fitting. Page created in 8.114 seconds with 20 queries.